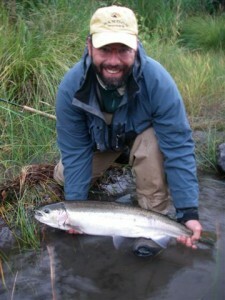 Chris Santella with a Deschutes steelhead. In addition to his work as a merchant of death, Chris is a frequent contributor to the New York Times, Forbes.com and many fly fishing publications. His work has also appeared in The New Yorker, Golf, Travel & Leisure, Travel & Leisure Golf, San Jose Mercury News, American Lawyer…and many others. His marketing clients have included Ask Jeeves, Travel Oregon (the tourism arm for the state of Oregon) and many start-up companies that he hopes will one day be purchased so he can cash out his options and buy some better clubs. When he’s not writing, casting a Freight Train in the Deschutes River for steelhead or hitting short irons dead right at Bandon Dunes, Chris plays guitar and sings (at least he calls it that) with Catch & Release. Some of his marketing work is collected at www.steelhead-communications.com. Listen to Catch & Release at www.myspace.com/catchreleasepdx.